Dr. Rebecca Sockbeson is of the Penobscot Indian Nation, Indian Island, Maine, the Waponahki Confederacy of tribes located in Maine, United States and the Maritime provinces of Canada. She is the 8th child of the Elizabeth Sockbeson clan, the auntie of over 100 Waponahki & Stoney Sioux youth and the mother of three children who are also of the Alexis Nakota Sioux First Nation of Alberta. A political activist and scholar, she graduated from Harvard University where she received her master’s degree in education. She went on to confer her PhD in Educational Policy Studies at the University of Alberta, specializing in Indigenous Peoples Education. Her research focus is Indigenous knowledge, Aboriginal healing through language and culture, anti-racism and decolonization. Her doctoral study engages with how Indigenous ways of knowing and being can inform policy development. She currently serves as Associate Professor for the University of Alberta’s Indigenous Peoples Education Program. 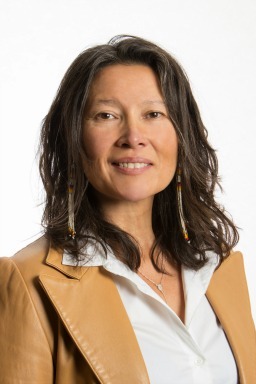 In 2013, she and her Indigenous colleagues received a University of Alberta Human Rights Teaching Award for her role in coordinating and teaching Alberta’s first compulsory course in Aboriginal Education, EDU 211: Aboriginal Education & the Context for Professional Development. Sockbeson's poem, “Hear me in this concrete beating on my drum,” was a winning entry in the Word on the Street Poetry Project in 2018 and is sandblasted on a downtown Edmonton sidewalk as part of a permanent public art installation. Sockbeson, R., Weber-Pillwax, C., Sinclair, J., Louis, C., & Auger, S. (2018). Red Hope Pedagogy. Cultural and Pedagogical Inquiry, 10 (2), 50-57. Sockbeson, R. (2017). Indigenous Research Methodology: Gluskabe's Encounters with Epistemicide. Postcolonial Directions in Education, 6 (1), 1-27. Sockbeson, R. (2017). Waponahki Anti-Colonial Resistance in North American Colonial Contexts: Some Preliminary Notes on the Coloniality of Meta-Dispossession. In D. Kapoor (Ed. ), Against Colonization and Rural Dispossession (1st ed., pp. 28-42). London, UK: Zed Books. Sockbeson, R. (2016). Honored and Thriving: The Squaw Law and Eradication of Offensive State Place-Names. American Indian Culture and Research Journal, 40 (2), 123-138. Sockbeson, R. (2016). Reconciliation in the Face of Epistemicide. Canadian Journal of Native Education, 38 (2). Sockbeson, R. (2011). Cipenuk red hope: Weaving policy toward decolonization & beyond. PhD dissertation, University of Alberta. Sockbeson, R. (2009). Waponahki intellectual tradition of weaving educational policy. Alberta Journal of Educational Research, 55 (3), 351-364. Indigenous Knowledge Mobilization: A Purposeful Collaboration Between Indigenous Communities and Higher Education (2018). Principal Investigator, Social Sciences and Humanities Research Council of Canada, Office of the Vice-President for Research, University of Alberta. Compulsory Aboriginal Education Coursework Toward a Revised TQS Compliance & Implementation (2018). Principal Investigator, Alberta Education, Office of the Vice-President for Research, University of Alberta. Institutionalizing Reconciliation; Systemic Knowledge Mobilization & Indigenous Knowledge Transfer (2016). Principal Investigator, Grant Assist Program Bridge Funding for SSHRC Insight Grant, Office of the Vice-President for Research, University of Alberta. Indigenous Knowledge Mobilization (2016). Principal Investigator, Expanding Inclusiveness in the Academy: Indigenous Community Engagement, Research, and Learning: FGSR, University of Alberta. Institutionalizing Reconciliation: Teacher Preparation & Aboriginal Education Courses (2014-2015). Principal Investigator, University of Alberta Endowment Fund for the Future: Support for the Advancement of Scholarship (EFF: SAS) grant, University of Alberta. Indigenous Knowledge Mobilization (2011-2013). Principal Investigator, University of Alberta, Faculty of Education Office of the Dean, Faculty Research Start up Grant. Uplifting the Whole People Through Constructing an Intellectual Space that Engages Indigenous & Western Epistemologies (2012). Office of the Provost Innovation in Education Grant, University of Alberta. Sockbeson will deliver a talk, "Red Hope: Indigenous Healing through Feminist Action," Friday March 15, 2019 at 12:30 PM as part of the Indigenous Feminisms Workshop. The event will be located at: The University of Alberta, City Room, 5th Floor Peter Lougheed Hall, 11011 Saskatchewan Dr NW. Sockbeson served as the moderator for an on-campus teach-in event on March 22, 2018, "Educating for the Justice of Indigenous Peoples: a teach-in responding to the Stanley and Cormier Verdicts." Sockbeson's research is referenced in the 2018 Teacher's Guide, Dawnland, a resource to accompany the film, Dawnland: A Documentary about Cultural Survival and Stolen Children. Sockbeson contributed to and collaborated with other Anti-racist scholars on the creation of an online discussion guide on the Gerald Stanley verdict regarding Colten Boushie's death. Illuminate: The Faculty of Education Online Magazine feature: "Less than 1%"
Interview with Dr. Sockbeson in Illuminate: "Countering the ‘common narrative’ about Indigenous victims of violence"